Today , I will share with you a recipe that can be served in two ways. 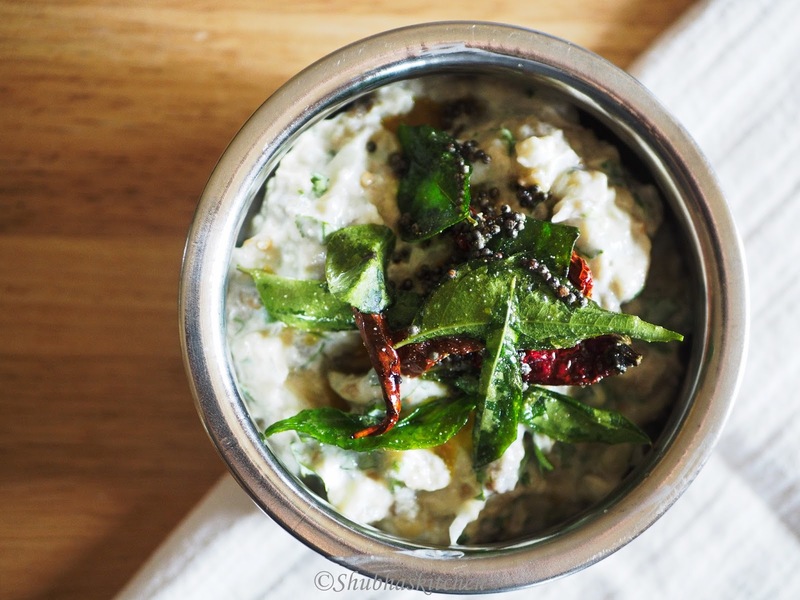 First, as a "Roasted Eggplant Raita" which can be served as a side with spicy rice dishes. The same recipe can be modified a little to be served as "Gojju". Gojju is a dish that primarily belongs to the cuisine of Karnataka. 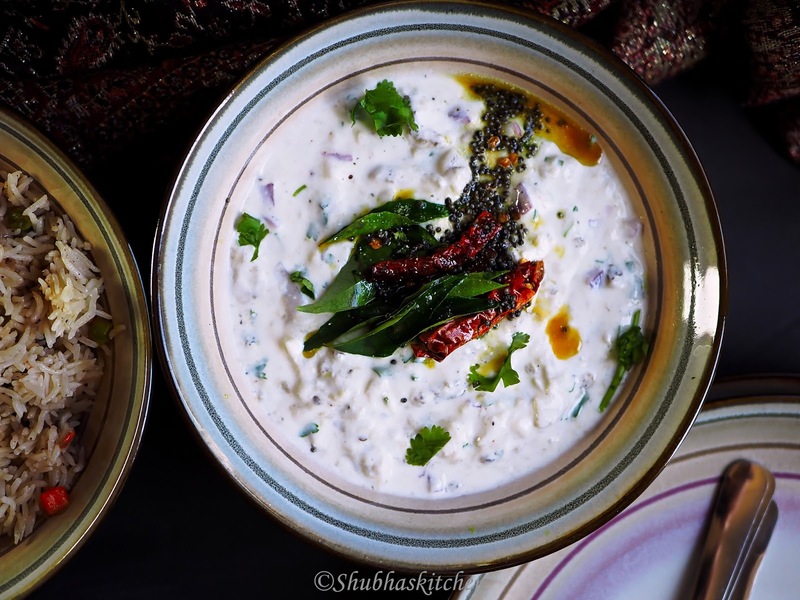 Badanekayi or Eggplant gojju can be eaten with plain rice with some coconut oil drizzled on the top:) The only difference between the raita and gojju is that we will use more yogurt for raita (for a more liquidy consistency). Also when it comes to "gojju" , we will use sour yogurt to add the necessary tang. You can see the pics of the gojju at the end of the post. Preheat the oven to 400 F . Keep an aluminium sheet in the baking sheet. Apply some oil on the surface of the eggplant. Prick some holes all over the eggplant using a fork or toothpick. Place it on the baking tray. Bake for about 1 hour or until it is cooked (Keep rotating it every 10 minutes for even cooking). Lastly, BROIL on high for about 10-15 minutes rotating the eggplant every 1-2 minutes (Keep close eye at this stage). Remove from the oven and set it aside to cool. Once it has cooled enough, remove the skin of the eggplant. Now, using the back of a fork, mash the eggplant. Take a mixing bowl, add the mashed eggplant, onion/shallots, yogurt , green chillis, cilantro and salt. Mix well. To prepare the tempering, heat the ghee/ clarified butter. When hot, add the mustard seeds, dry red chilies .When the seeds start to splutter, add the asafoetida and the curry leaves. Add the tempering to the raita and serve. 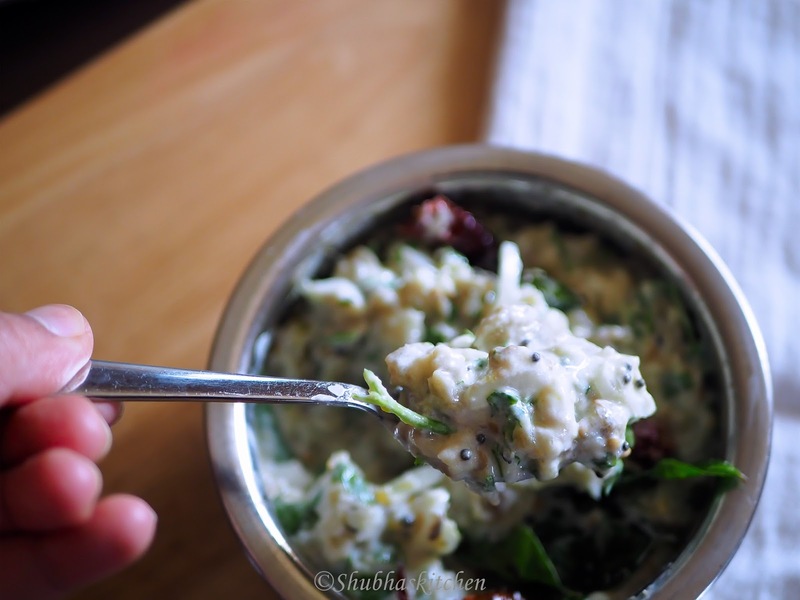 Above mentioned recipe is for the raita. If making a gojju, use sour /tangy yogurt. Also, reduce the amount of yogurt to just 1 cup. 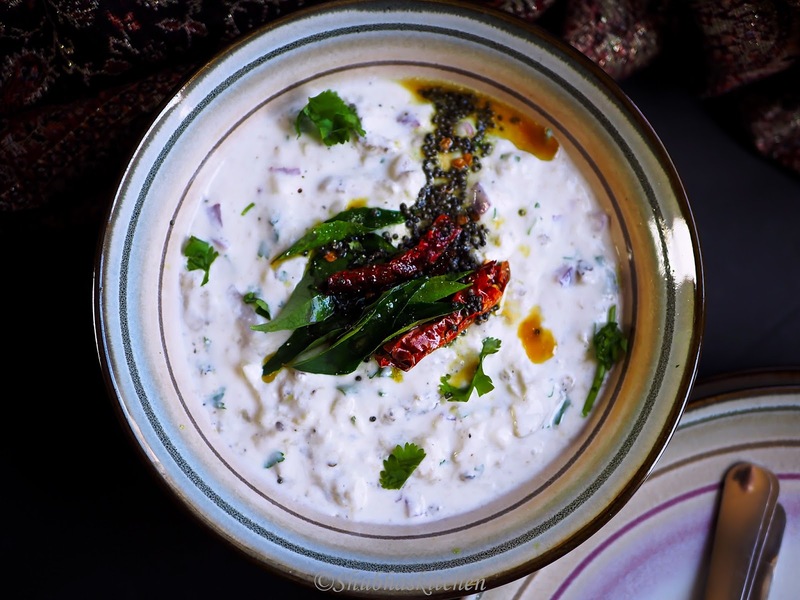 The gojju is more chunky where as raita is more runny in consistency. Have not used Oven for Egg plant till now. Easy way out to get this cooked. Thanks Shubha. This is very new recipe to me. I never tried this. Made this a couple of times. I can vouch on its fabulousity. Always a pleasure, in fact, one of the best dishes for a satisfying rice meal.